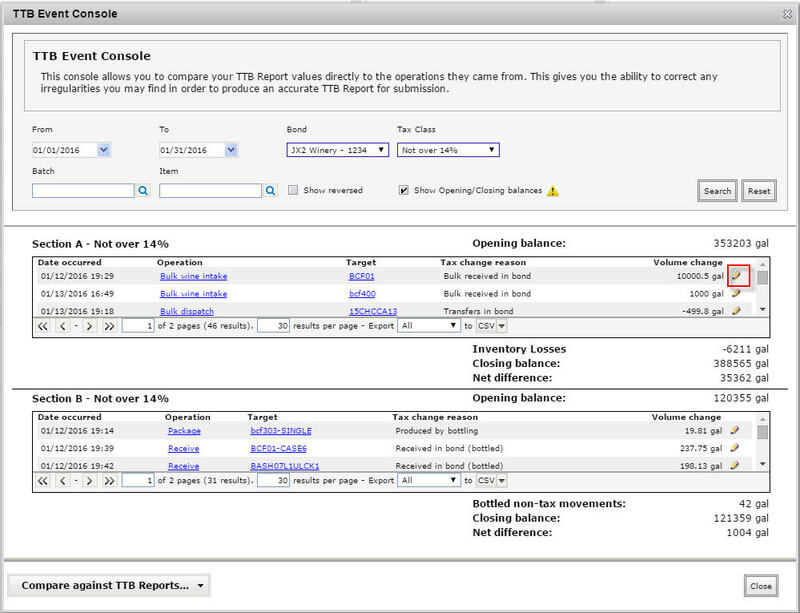 The TTB Event Console is a new feature in vintrace that shows all the TTB events for a selected bond and tax class within a date range. You can click on each event to go to the operation/action that caused the event. 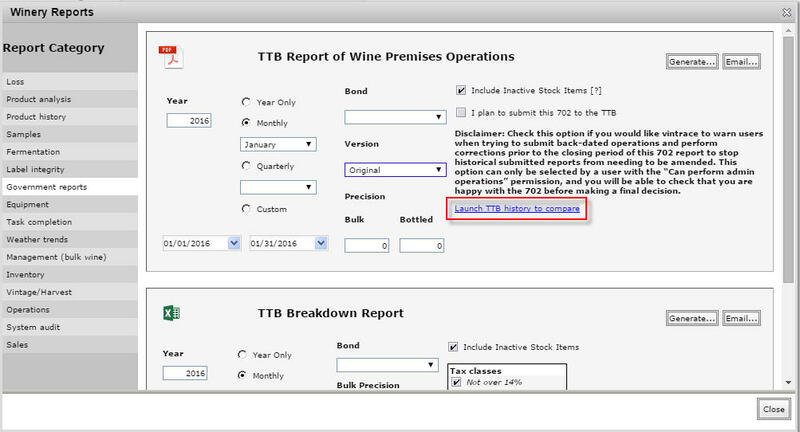 Another way to access the TTB Event Console is from Winery Reports – Government Reports – TTB Report of Wine Premises Operations, then click on Launch TTB history to compare. 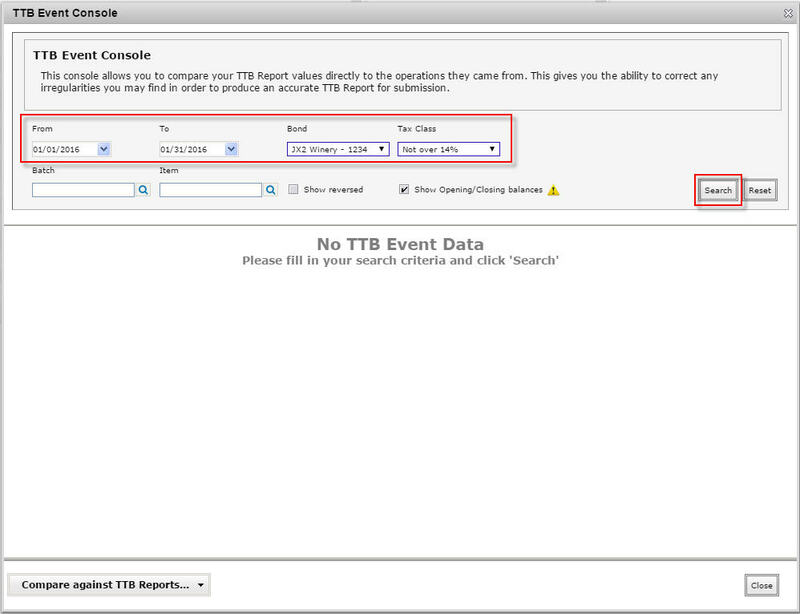 To run the console, you have to select the From and To dates, Bond, and Tax Class of the TTB events you want to view and then click on Search button. You also have the option to filter the search either by Batch or Item. The From and To dates are set to the start date and end date of the previous month by default. 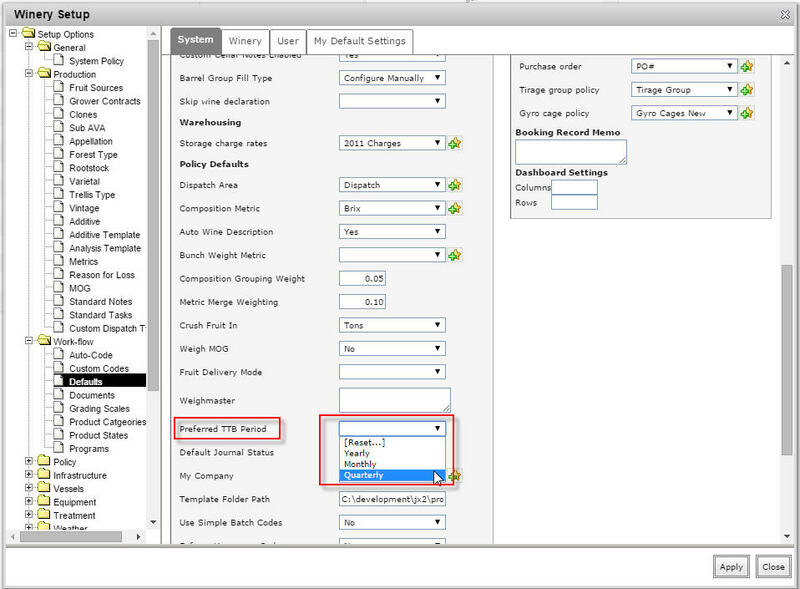 You can change the default date range to yearly, quarterly, or monthly by going to Winery Setup – Work-flow – Defaults and under Policy Defaults set the Preferred TTB Period. 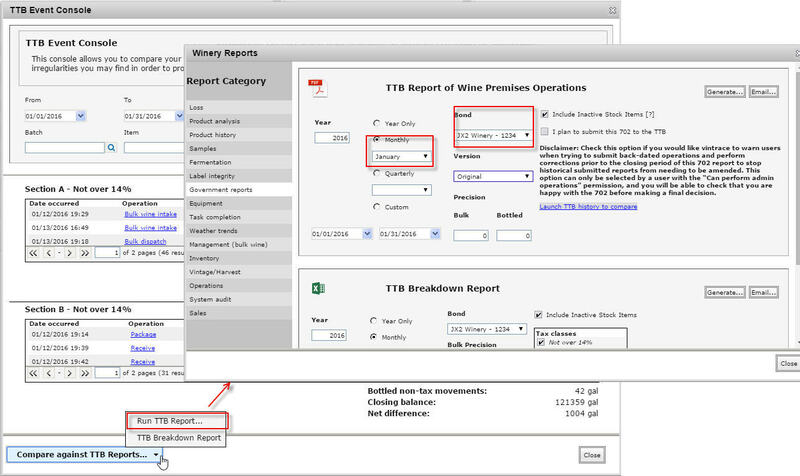 Please note that this setting also changes the default period when you run the TTB reports under Winery Reports – Government reports. 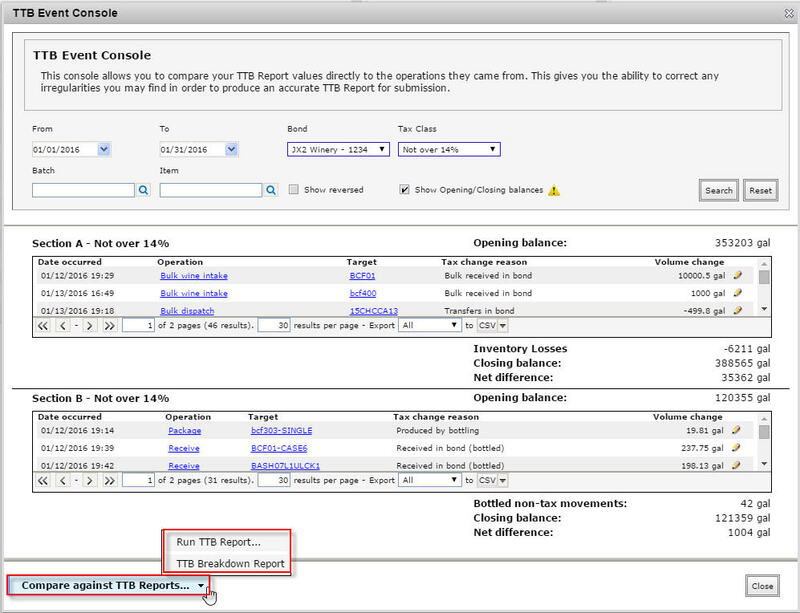 The event data in the TTB Event Console is separated into Section A and Section B, and they correspond to the same sections in the TTB report. Each section shows the Opening and Closing balance for each section if you ticked the Show Opening/Closing balances checkbox. 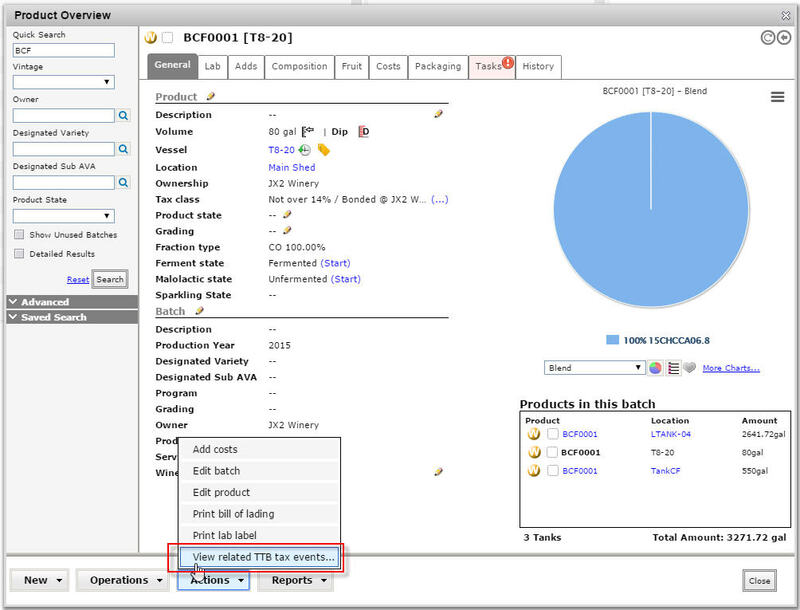 The TTB Event Console also shows the detail of each event such as Date occurred, Operation, Target (batch or stock item code), Tax change reason, and Volume change. Clicking on the operation link for each event will bring up the operation screen that caused the event. In the example below, we clicked on the Bulk wine intake operation under Section A. 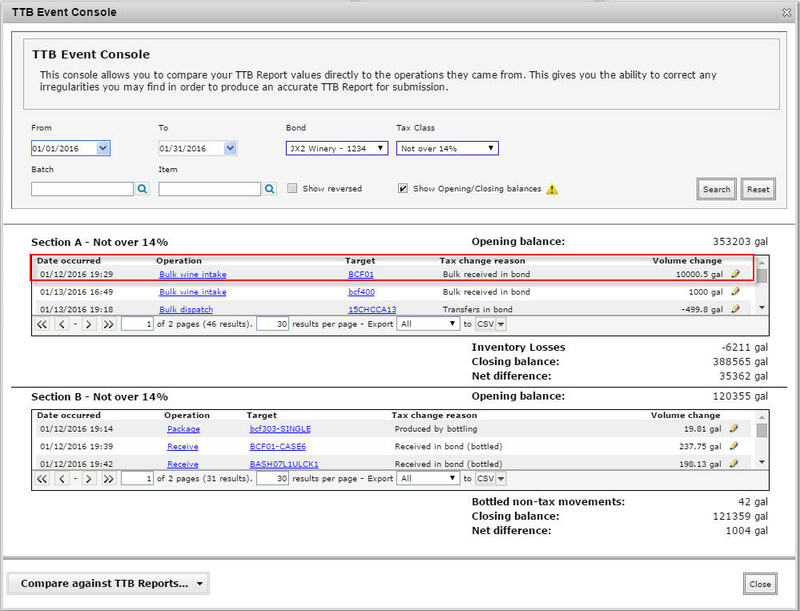 You can also compare the TTB events against the TTB reports for the date range, bond, and tax class you have selected in the console by clicking on Compare against TTB Reports… button. You have the option to either Run TTB Report or TTB Breakdown Report. 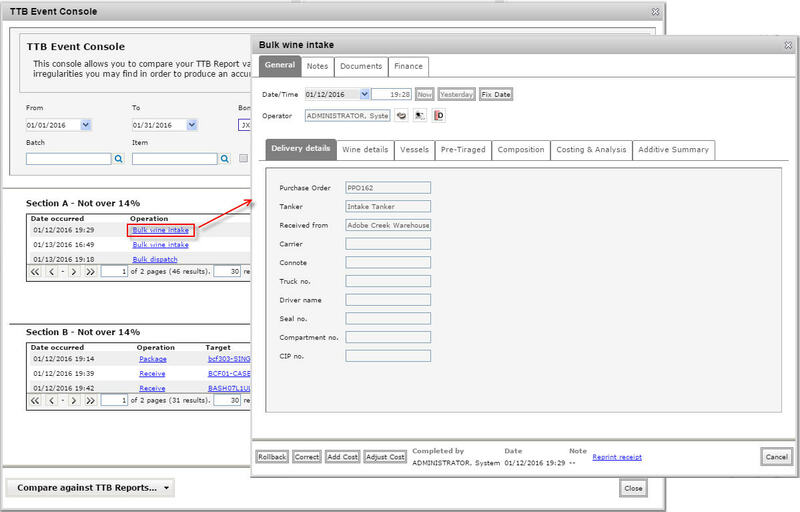 Clicking on Run TTB Report would bring up the TTB Report of Wine Premises Operations screen with the date and bond selected based on the one you have in the TTB Event Console. You can edit the Tax Volume Event details of a TTB event by clicking on the pencil icon beside the event and this will show you the Tax Volume Event [UPDATE] screen. Note: You need to have the Can edit TTB Tax Volume Events user permission in order to edit the Tax Volume Event details. In the Tax Volume Event [UPDATE] screen, you can change the details such as Volume Change, Tax class, Tax state, Tax change reason, and Bond. 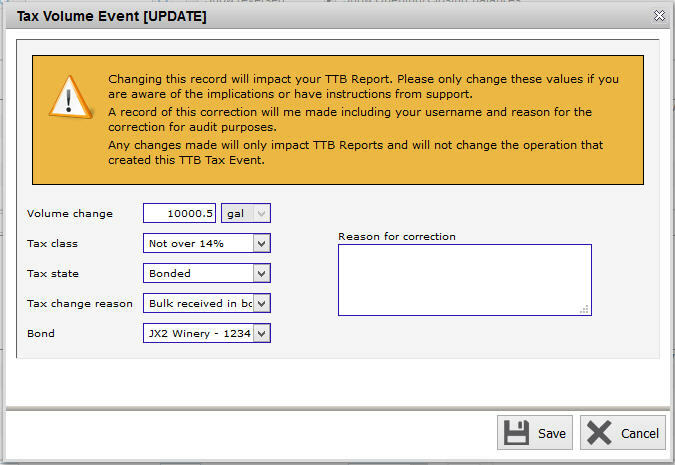 Any changes you make in this screen will only impact the TTB Reports and will not change the operation or batch/stock item that created the TTB tax event. We urge you to please be cautious if you do choose to edit the Tax Volume Event details because this will impact your TTB report.